His name is everywhere in Italy, found on streets, piazzas, and monuments throughout the country. He is also renowned in the western hemisphere for his military successes in Brazil and Uruguay. Between May and September of 1860, Garibaldi captured the island of Sicily for Victor Emmanuel II, and marched up the Italian peninsula toward Rome. Along the way volunteers swelled his forces from an initial 800 to about 24,000. He played a crucial role in uniting Italy, and is considered a national hero. 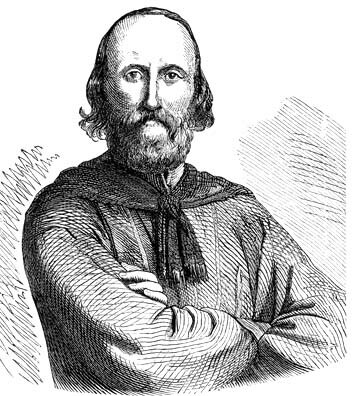 He [Garibaldi] said that the only way in which he could render service, as he ardently desired to do, to the cause of the United States, was as Commander-in-chief of its forces, that he would only go as such, and with the additional contingent power—to be governed by events—of declaring the abolition of slavery; that he would be of little use without the first, and without the second it would appear like a civil war in which the world at large could have little interest or sympathy. Had Lincoln and Garibaldi come to agreeable terms, we Americans would no doubt be more familiar with his name. This entry was posted in History, Uncategorized and tagged Garibaldi, history, Italy, Naples, sicily. Bookmark the permalink. That’s an interesting article, dragonflyshine. It does convey the sense that, though we often think of the Civil War being “all about” abolishing slavery, that was not the intention or purpose at the outbreak of hostilities. I wonder what other Italian connections there are with our Civil War. Sandy- there is a Mount Garibaldi up near Whistler in BC. Is there a connection? Sandy- there is a mountain named Garibaldi up by Whistler in BC. Is there a connection?